Subaru has given a strong indication at what its next crossover will look like with the XV concept. The Geneva Motor Show prototype will form the basis of the new XV, which will use the same platform as the Impreza and reach the UK in 2018. 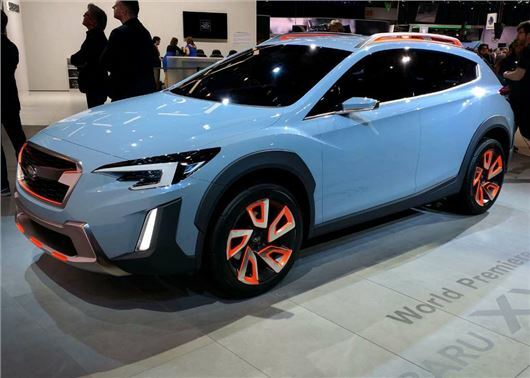 The XV Concept showcases Subaru’s next-generation design language, with robust styling that's dominated by a large hexagonal grille, ‘hawk-eye’ headlamps and orange accents. The 19-inch aluminium wheels are surrounded by plastic-clad bumpers and underbody protection, which should help prevent damage when off-roading. The concept also features an exclusive new paint finish, ‘Glacier Khaki Silica’ – a newly-developed blue-grey tone that Subaru claims "evokes the appearance of glacier ice". The Geneva concept coincides with the mid-life revisions for the current XV , with Subaru giving its crossover an updated cabin, slight styling and economy tweaks and a new infotainment system. The updated model goes on sale in March and prices are unchanged – the 2.0-litre petrol manual in SE trim costs £21,995 while the top-spec SE Premium diesel costs £25,995.